I cannot believe it's already almost Christmas! Today, I thought I would share a few holiday and winter outfit ideas from outfits that I've worn in the past. I typically like to keep is comfy and casual for the holidays, but I always like to add a bit of fun to the outfit. I'll have all details of each outfit linked, but I'll also be sharing different ways to style each outfit! The turtleneck and cardigan look is a classic in my option, and this outfit is perfect for a casual holiday gathering or Christmas Eve. If you have a red cardigan, this outfit will be extra festive! If you have a black turtleneck, you can easily pair it with so many different cute cardigans. Black booties always look amazing paired with anything, so they're the perfect shoe to wear this holiday season with a variety of outfits. I'll be linking the pieces that I'm wearing in this photo, along with some other similar pieces so you'll have your pick of cute pieces to wear this holiday season! A cute winter dress paired with riding boots is always a great option if you aren't sure what to wear. This winter, I've been especially loving turtleneck dresses. This is great Christmas Eve outfit, or even Christmas Day! You can pair the dress with a nice statement necklace and a cute clutch to dress up the outfit even more! A beige cardigan paired with a nice scarf is the perfect winter outfit! Cardigans are my favorite winter pieces... I seriously wear them all the time! A cozy cardigan and leggings is definitely my go-to outfit for winter. I also love a good pair of high heeled boots to add a little something to the look. 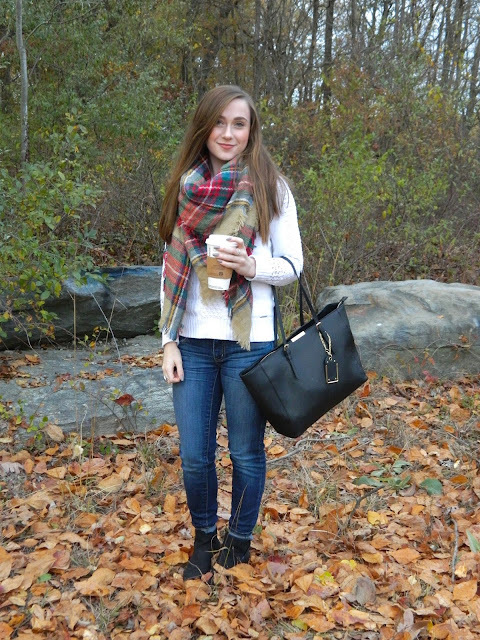 Blanket scarves have been my obsession this fall/winter. 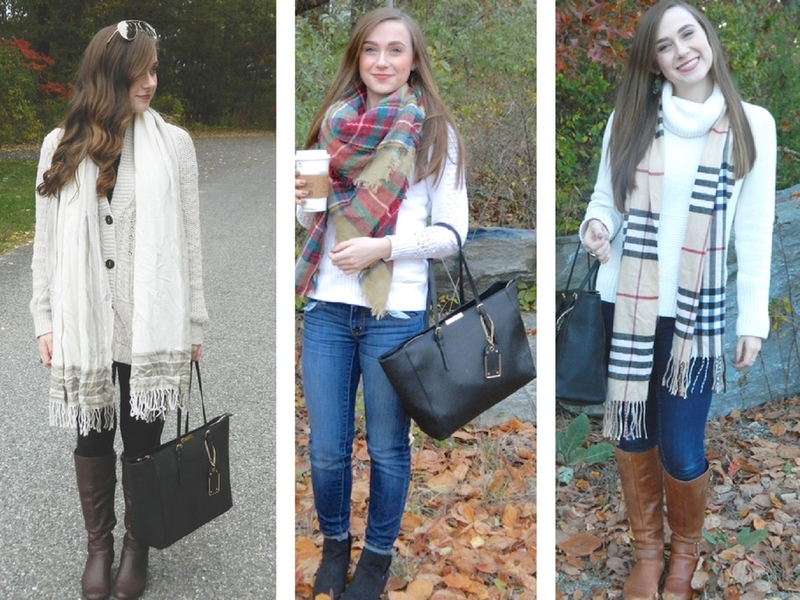 I'm linking a few of my favorites, and there's so many different ways to style them! I love the way this one looks paired with these faded jeans and this white sweater. Again with my favorite black booties! Turtleneck sweaters are another one of my favorite winter pieces. This white one looks adorable with this plaid scarf. This is the perfect simple winter outfit, and this sweater is super cozy! I paired this outfit with riding boots, and I love the way it turned out. Riding boots are a great option for the winter and holiday season! I've been wearing this cozy sweater over and over this fall and winter. I've paired it with jeans and leggings, and I feel like it looks both ways! In this post, I decided to wear it with jeans though. A simple sweater paired with jeans or leggings is the perfect winter outfit! I also added booties and an infinity scarf. 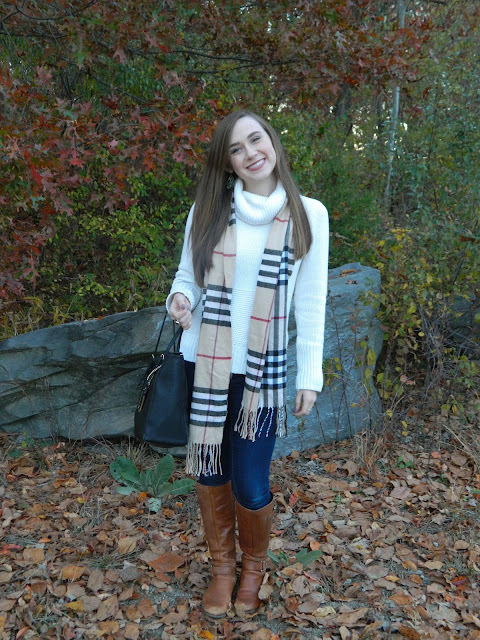 I'm linking the scarf I'm wearing in the photo along with some other cute infinity scarves that are perfect for winter! I wore this outfit in my most recent outfit post, and it's definitely another one of my go-to looks for winter. I love a good vest paired with either a solid or patterned sweater. You can't go wrong with this black vest, because you can literally wear it with almost anything. 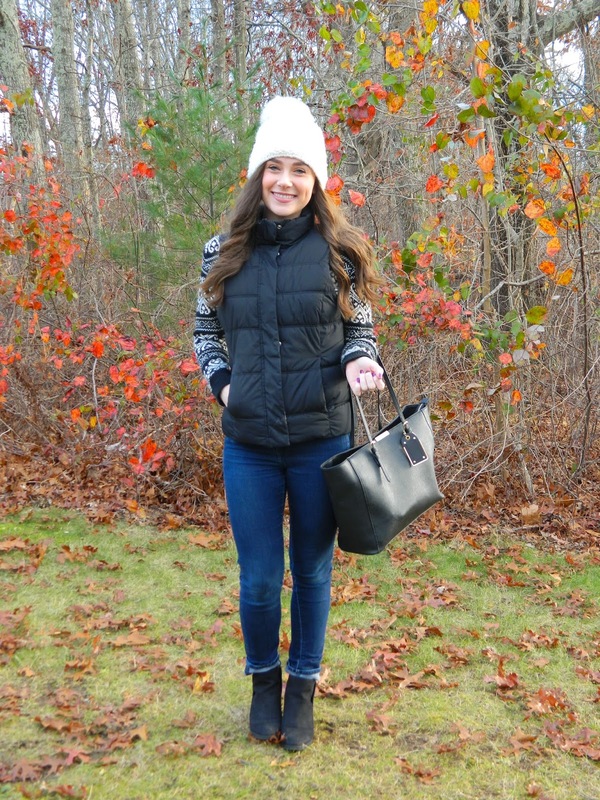 I'm also obsessing over pom pom hats this year, so I'll be linking a bunch of my favorites below along with the rest of the outfit and a few similar pieces! What are some of your favorite pieces/outfit combinations this year?